Welcome back to the blog, everyone. I hope by now we’ve all recovered from our turkey comas and family togetherness and that we’re all back to our regular routines. I was lucky enough to be surrounded by my wonderful wife and children this holiday, but I also had a great experience with one of my patients that I wanted to share with all of my readers. st taken a shower to get ready for the holiday meal, and she’d noticed that some of the skin on his big toe was a little red, although he wasn’t experiencing much pain. Since his nails were already soft, she went to trim the toenails and noticed that the big toenail on the red toe was pressing into the skin. Thinking she could stave off a potential ingrown toenail, she attempted to lift up and trim the nail: big mistake! As soon as she put the nail scissors to the nail, her son winced in pain. When she looked down at the nail, she could see blood and what appeared to be pus, a clear sign of infection. 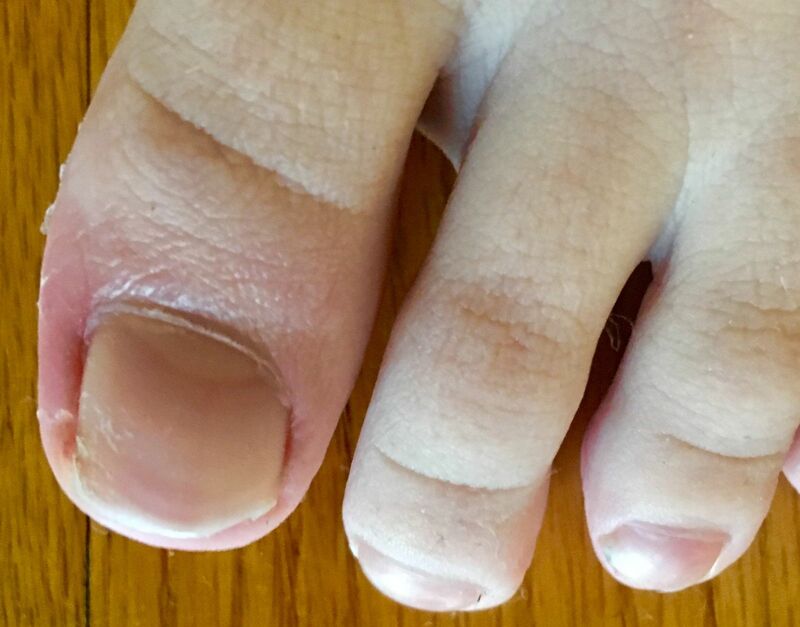 All of these signs were clear that she was too late: when a toenail is ingrown, the nail is curved downward and grows into the skin, usually at the nail borders. This “digging in” of the nail irritates the skin, often creating pain, redness, swelling, and warmth in the toe. And that’s where she was clearly at with her son when she texted me (see the picture she sent over, at the right) unclear of how to proceed on a holiday weekend, but worried about ignoring the problem until I resumed normal office hours. Now, before we continue with this tale, I do want to note that I don’t typically deal in over-the-phone medicine—I’m best able to serve you when you come into my office. But, I’m also a dad, and I can’t stand to think of a child’s Thanksgiving being ruined because of a painful foot infection. So, I jumped into action. First, we found a pharmacy that was open on the holiday and quickly called in a prescription for oral antibiotics—a step that was necessary to keep the existing infection from spreading beyond the little boys toe. Then, I provided instructions for care to get them through the rest of the holiday weekend: the boy was to soak his toe in warm water, with Epsom salt, twice a day, every day, until they were able to get into my office. Once the holiday weekend was over, the mom and child checked back in and, thankfully, our emergency measures had worked well! The skin on the toe was far less red, the nail had grown out and away from the skin and was ready for me to carefully trim, taking care not to cut it too short or too aggressively. The little boy was able to walk out of my office comfortably, having survived a holiday weekend toe emergency. In talking with mom, we reviewed several points about ingrown toenails, all of which I’ll share with you now. 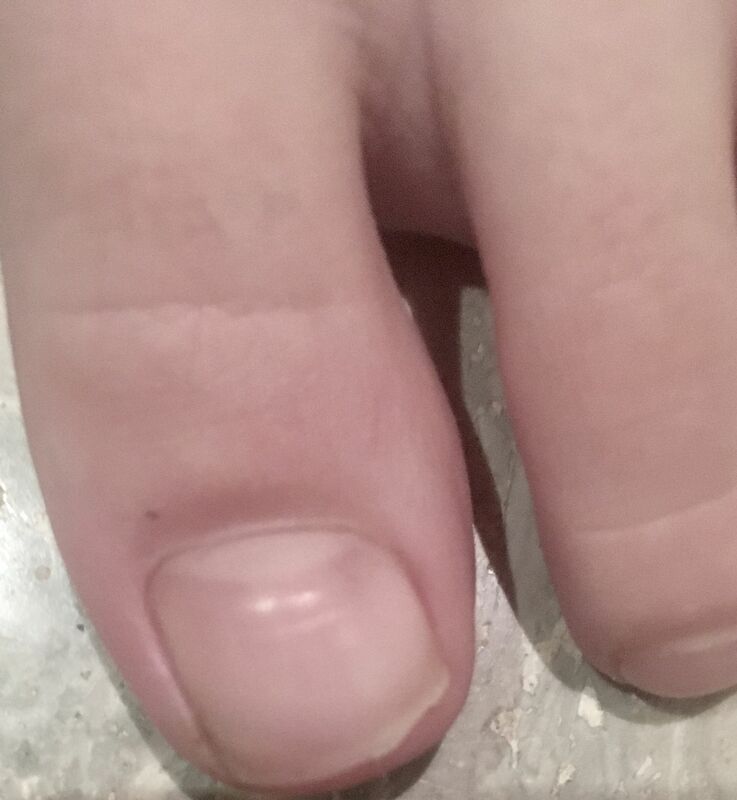 The most important thing to note is preventative trimming: when cutting your child’s toenails, you should always take care to cut the nail straight across and leave plenty of white at the top of the nail. The most common cause of ingrown toenails is improper trimming: cutting your nails too short encourages the skin next to the nail to fold over the nail. Another cause of ingrown toenails is wearing shoes that are tight or short, so mom and I also talked about choosing shoes for her son with plenty of room in the toe box. Finally, talk turned to her attempt at “bathroom surgery.” While I completely understood her instinct to try and protect her son, I just wanted to emphasize how lucky we were to turn the ship around. Self-treating an ingrown toenail can worsen the infection and complicate the situation; in certain situations, ingrown toenails become so bad that I can only treat the problem by surgically removing the nail. While this was not the outcome in my Thanksgiving situation, I wanted to warn this caring mom, and all of you, about the danger of attempting to deal with a child’s foot problem on your own. I’d always rather you turn to me—yes, even on Thanksgiving—than accidentally create a bigger problem for your child by trying to solve a problem that you’re not properly equipped to cure.